An area we are very active in is that of protective coatings and surface preparation. Our clients include all major oil companies, Shell Chemicals, Transfield Services and Dulux Paints. This extends to specialist areas such as graffiti management, surface etching, clear coats, moisture control and anti-static treatments for high voltage equipment. We are approved applicators for a wide range of manufacturers including Resene, Dulux, Wattyl, International (Akzo Nobel) , Carboline and Altex Devoe. We apply many types of coatings and use many different application techniques. Whether your job involves use of acrylics, modified urethanes, chlorinated rubber, moisture cured urethanes or epoxy mixes H20 Contractors should be a first port of call. 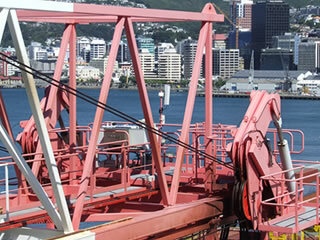 We have experience in specialised coatings from manufacturers such as Zinga and Wasser available in New Zealand from PPG Industrial Coatings. With Wellingtons fuel and oil storage facilities sited in an exposed marine environment coatings must withstand extremes of nature. Preparation quality and coatings application must be done to very high standards. Such committment to quality and meticulous Quality Assurance recoding are why we are one of the countries busiest coatings firms. We support a wide variety of preparation options including water blasting, hot water, wet slurry, dry sand and a full range of manual tools and attachments. Our commitment to latest technology and development means most of our plant can perform a wide variety of functions. Dry sand blasting using a wide variety of abrasive media. H2o has water blasting truck units with jetting equipment allowing us to water blast at high pressures (to 12,300 psi @ 102 l/m or up to 36,000 psi @ 18 l/m) . A zero thrust-gun also allows underwater blasting applications where vessel slipping is not a viable option. Typical work undertaken using these trucks includes removal of salt contamination, moss & mould control, loose paint removal, graffiti removal, chemical washing, rust stripping and surface profiling to industry standards commonly SA2.5 – 3.0. H20 Contractors Ltd maintains a firm commitment to environmental protection, public safety and “best practices” when undertaking any work.